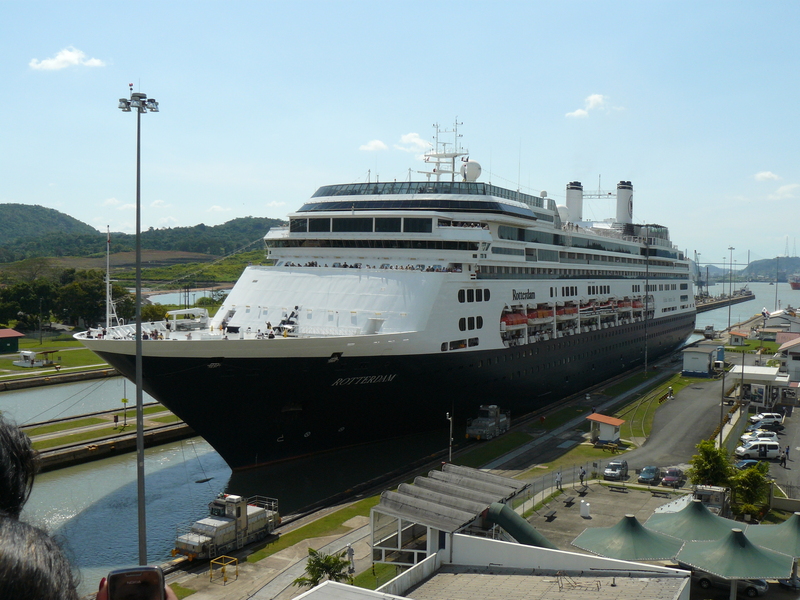 Many of us from the US have long-held a fascination with Panama, and especially the Panama Canal, which was managed by the US until 2000. This engineering marvel has been operational for nearly 100 years. When you see how expansive this 80 Km canal is – it stretches from the Atlantic to the Pacific, it is difficult to believe that it was constructed 100 years ago. Today it continues to move 14,000 ships through this passageway every year. The technology is modern and has an elaborate quality control system so it doesn´t fail. In addition, the canal is currently being expanded so that in 2014, ships as wide as 55 meters (?160 feet) will be able to pass through the canal. Currently the canal is run solely by the people of Panama. As you can imagine, the impact on Panama City is enormous, it is a huge center for commerce and banking and there are mega shopping malls that rival those in any modern country. As we visited Panama City, an urban community of 3 or 4 million people and with an expansive skyline of modern buildings, the contrast with every day life for the majority of inhabitants of Panama City was at times disturbing. As we stood near the well-known fish market on Balboa Avenue, a look to the right showed this, which is only a portion of the skyline for the commercial district. Immediately behind several of these modern skyscrapers was a community of stilt houses right in the water. With no electricity or other services, their cobbled together stilt houses and boardwalks were at times under water when the tide came in and they sat in mud when the tide went out. For the very poor such as these people or those who live in tenement housing, there are no publicly supported services as in some countries. As we looked straight ahead of us and stepped around to look behind us there were dozens (probably really hundreds) of high-rise apartments that looked war-torn, sometimes with no doors or windows and non-functional plumbing. In this intense 90 degree heat, one can only imagine the living conditions. Some are occupied by squatters and some actually pay rent for these horrible dwellings. I tried to photograph a few of these tenements but photos just don´t capture the desperate situation. Still standing from the same viewpoint, a look to the right shows the beautiful and historic old city or Casco Viejo which has been named a UNESCO world heritage site and which is now being restored to the beauty and regal of Colonial times. (This is also where we stayed while in Panama City). 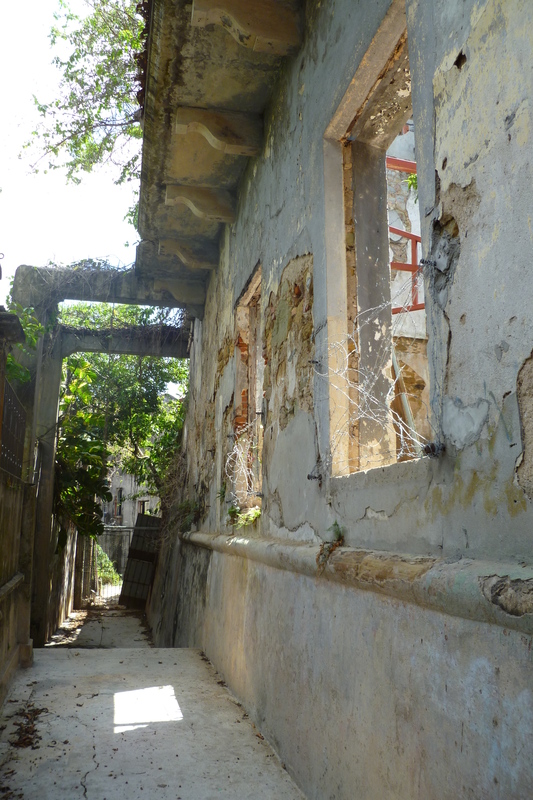 This neighborhood was allowed to deteriorate to a state which one can´t imagine until you walk through the neighborhoods. Now as foreign money is being infused in to the old quarter, it is being restored to its original beauty and will likely return to the state of glory of earlier times. Urban disparity is likely a ubiquitous problem, however in this city or possibly in the country (we only visited Panama City and Colon which is much worse than Panama City) the contrast between those who have and those who don´t is so obvious everywhere you go. Simultaneously there is urban wealth. For example, people with money take the air-conditioned new buses and poor people take Chicken Buses (they call them ¨Red Devils¨). 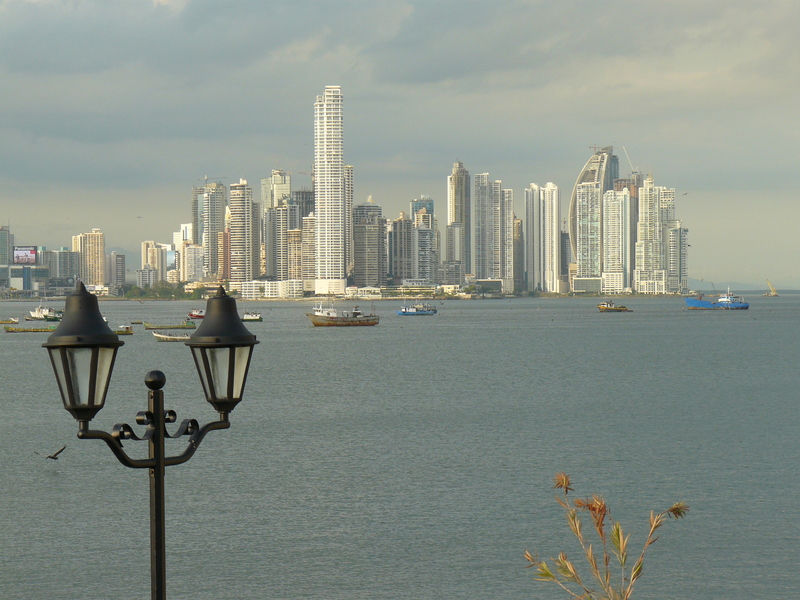 It was very different in Panama, unlike the other Central American countries we visited, there is money in this country. 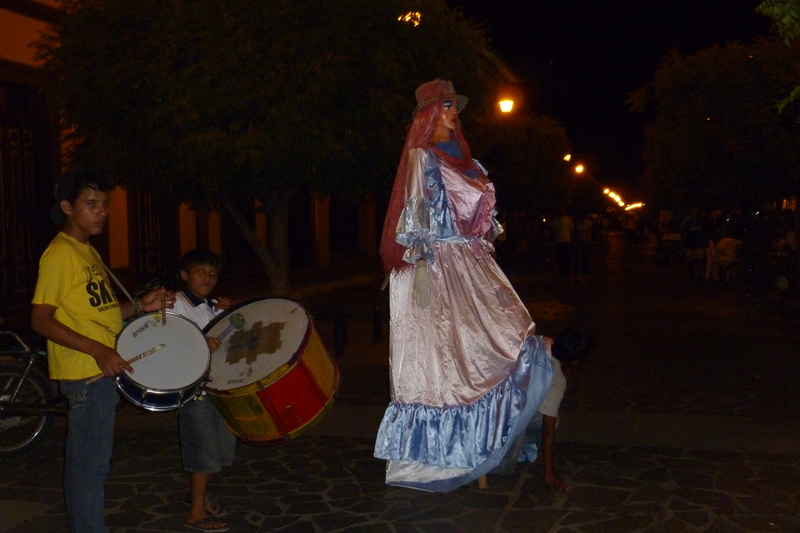 In our short time in Nicaragua, we only had enough time to visit three cities; Leon, Granada and San Juan del Sur. Each one was very different, making it difficult to describe the country or to generalize about our experience but we got enough of a taste of the country to know we would like to return. You’ve already heard about how difficult it was to get into the country but once through the border, we headed directly for Leon, which was an easy ride on relatively flat roads – a first for this trip. 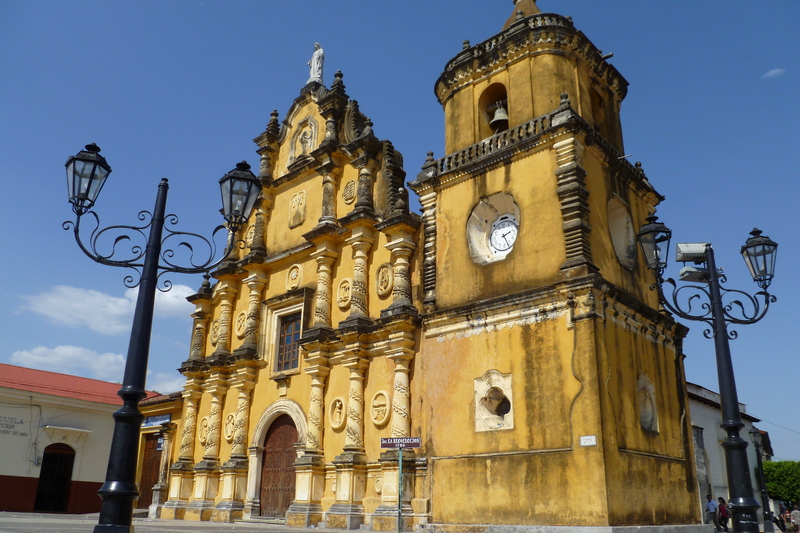 This city is one of the two remaining (and larger) of Nicaragua’s colonial jewels. This city of about 150k people is not only filled with colonial architecture and grand churches, but is also a market town. Every part of the city has a public market, big or small. These markets are accompanied by great street food often grilled in an old tire rim set on a stand of some type. In this area of the country, horse and cart is a major means of transportation; the city streets are willingly shared by cars, buses and horse and cart. The people of this region are friendly and kind; always willing to help a couple of confused N. American travelers. While tourism is increasing in this area, aside from young backpackers, we really didn’t see a lot of English-speaking travelers. One of the notable characteristics of Leon is how well tourists are integrated with those who live there, how tourism hasn’t taken over daily life and the fact that there’s not a souvenir shop on every corner – or anywhere for that matter. My least favorite thing was the intense heat – daytime temps near 100 and it didn’t cool down at night. 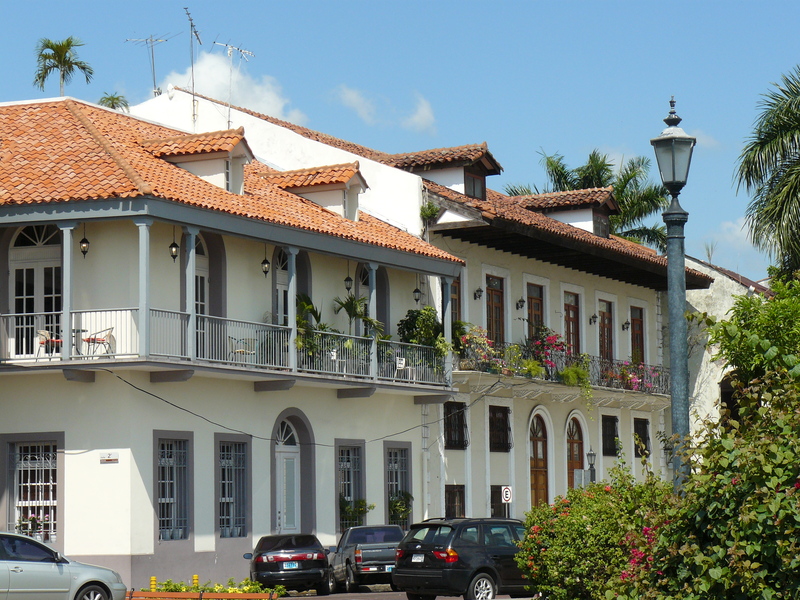 Named for it’s sister town in Spain, this colonial city is smaller and slightly more industrialized than Leon. It is suppose to be a haven for tourists. In reality it is a city where property and businesses are being purchased and run by expats from Europe and the US and thus driving up prices. 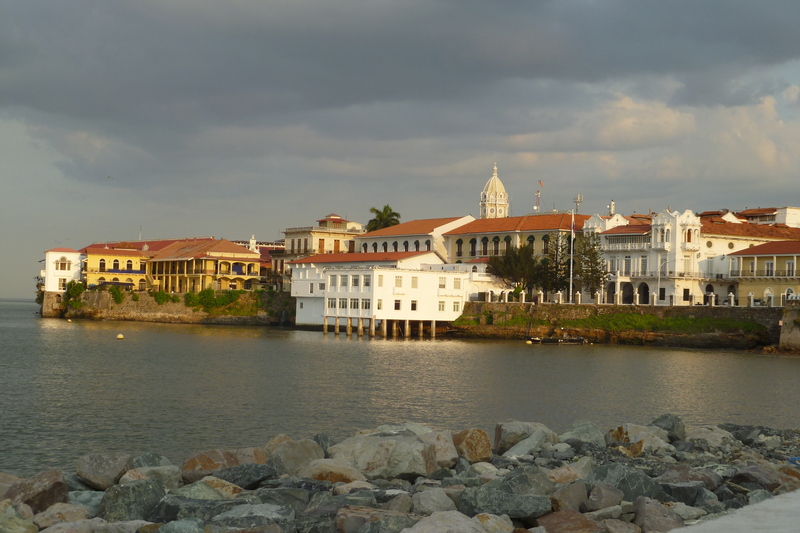 Tourism is well developed – Parque Central and the surrounding restored colonial buildings are lovely however when you walk three or four blocks from the tourist areas, there is one of the poorest areas we have seen to date. Nearly all of businesses around Lake Nicaragua seem to have failed. It was difficult to see if this was an impact of declining tourism in the past several years or ?? We were pleased to stay in a newly opened hotelaje and restaurant operated by two sisters and their two cousins. We’re hoping Saguan Joche, a family owned business, will be highly successful. La Calzada, the recently restored restaurant row (similar to Barcelona’s La Ramblas) is lively at night with street entertainers, music and of course great food and drink. My personal opinion is that Leon tops Granada although a visit to both is a necessity. This lovely little beach town was a great place to hang out for a few days. Totally a tourist spot and beach town, we made this stop so we could hit the beaches before Semana Santa. The beach is long and wide, and a favorite swimming spot for locals and tourists. The town is filled with great seafood restaurants and other very inexpensive local eateries. We usually ate breakfast for $2.00 or $3.00 if we splurged on a smoothies made from fresh fruit. Overall a great place to veg out. 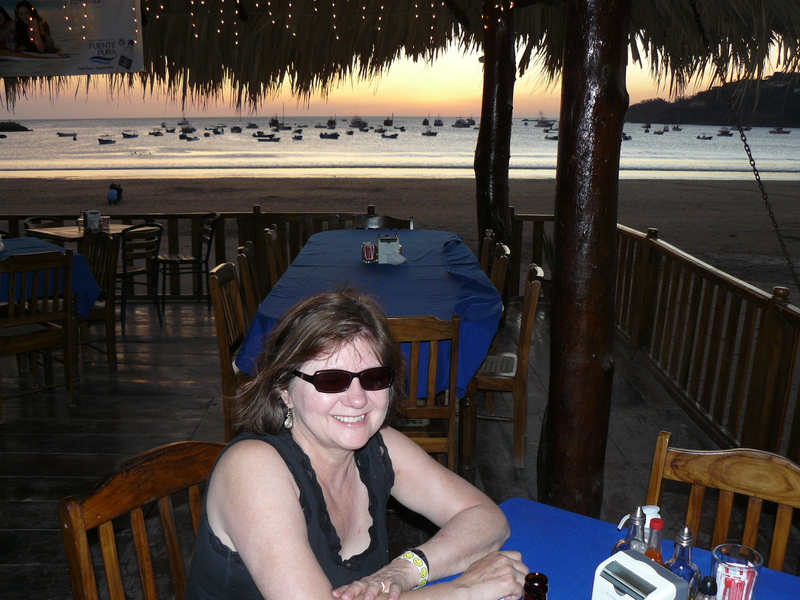 I heart Nicaragua and hope to return some day. Nicaragua Border: Helped or Hustled? In my last post I mentioned that we unexpectedly stayed an extra night in Honduras because we couldn’t make it to the border in time to pass through during daylight hours. We had heard and read that the Nicaraguan border is difficult to navigate and since we weren’t on a tour bus or an international bus, passing through the border in the light of day seemed like a sensible decision even though the Guasale entry point is open 24 hours. In retrospect, our decision was absolutely the right one. Given our dislike of early morning for anything, we were pretty pleased to be walking to the bus by 7am. This bus was an old 20 seat shuttle (of course this meant there were about 30 people on board) with torn and broken seats but it got us to our destination without incident. On the way to the bus station we didn’t pass any restaurants or bakeries, so we trusted the locals to supply food for our ride, and they did. Soon after we boarded a young woman was one of many who came on the bus. A bag of 10 of yesterday’s bananas for 25 cents was just right for the trip with a few left over – we left them on a park bench. The early morning air was pleasant, possibly even cool, for the one hour ride to “La Frontera” or the border. Before the bus came to a stop at it’s endpoint, a guy pushed open my bus window, popped his head in and scared the $x!t out of me. He and about 5 or 6 other “guides” were poking their heads in the window telling me how well they speak English and how they could help Kevin and me cross the border without problems. They each showed their picture ID so we would know they were legitimate – whatever that means. We kindly told them we would walk through with our backpacks. “Oh no, señor. It is 3 km.” Before we were off the bus one of the guys had already spotted Kevin’s backpack, taken it from the bus and tucked it under the seat of his pedicab. He was sealing the deal to be our personal guide and he wasn’t taking “no” for an answer. After all we were the only “Gringos” on this bus and there were dozens of other guides in the waiting. “There is no charge for the guide service, we just work for a tip.” We had signed on by nature of the fact that by now both of our backpacks were in the pedicab. We hopped in for the ride, not really knowing what had just occurred. 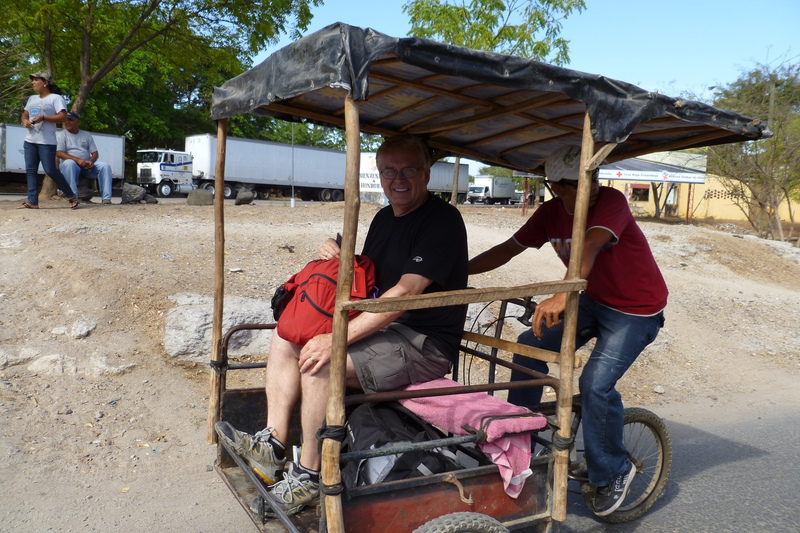 And by now our guide’s buddy had joined him so we each had our own pedicab. I need to divert for a minute to comment on the 3 km border. Having gone through a good number of immigration points in my life, it seemed illogical, maybe not true. Usually one needs to stop at the patrol for the departing country and then go to another building within eyesight to gain approval to be allowed admission to the arrival country. The pedicab trip began by riding past dozens and dozens of semi trucks and some cars in a very long line, waiting to pass through the border, while being approached by men with huge wads of money who wanted to “help” us by exchanging money for us. The claim was that their rate was “better” than the money changers on the Nicaraguan side. Refuting their claims, our guides said they would tell us when we met up with the money changers who were legitimate (i.e. their buddies) and would give us a good rate. There were no directional signs to tell us where to go. Our guides wove in, out and around the semi’s and finally got us to the Honduras departure line where dozens of locals were completing paperwork. The guides watched our luggage while we were approved for departure. The process took only a few minutes. We hopped back into our pedicabs and rode about another km, again there were no signs or directions. On the way our guides said that the entry fee would be $12 US. This was good to know since our tour book said $7 and there was no posting as in most countries. The posting of entry fees may not be necessary but it certainly makes one feel like the assessment is legitimate. We will never know if $12 was the real number or if the money just lined the pockets of the border patrol. In recent days we talked to two guys who paid $15, so maybe we got the blue light special. When we got to the Nicaragua border patrol, one of the guides again watched our bags and the other took us in through what seemed to be a back door. He stayed right with us and seemed to keep an eye on how much cash we had. Since we hadn’t been using US currency we had to dig to get it and we had a side discussion before pooling our remaining dollars to come up with $24 for the border tax. What we didn’t know is that our guide watched carefully to see how much money we had – interestingly that in about 10 minutes, that was the amount he would strongly suggest for a tip. We again got into the pedicabs for the third leg of the journey, passing through one more checkpoint, Our guides smiled at and greeted the patrol who waved us through. Finally we were in Nicaragua. The guides waved down a bus to Leon. As we were trying to get on the bus the guides were continuing to negotiate for a larger tip, even specifying that I had eight more dollars in my change purse. We got in the bus rode away, reflecting on this surreal experience. It was 9:30 am and we were exhausted from being helped and hustled; and more than ready to move on. 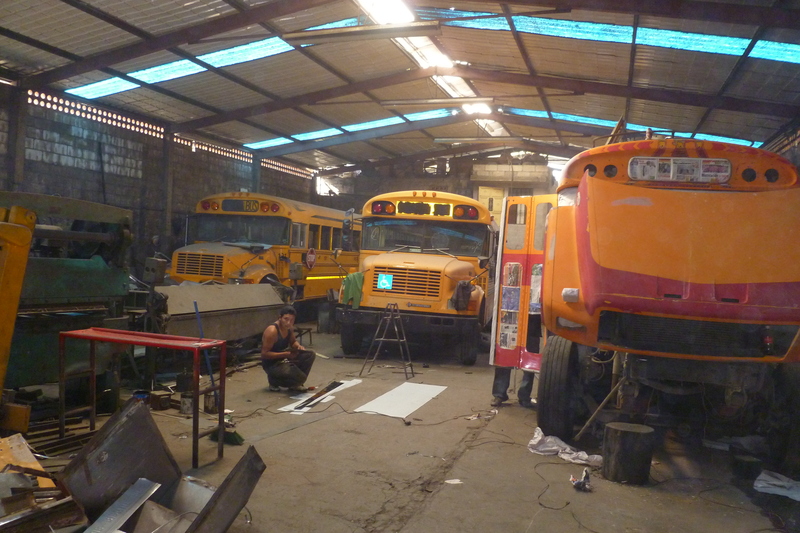 OK, so Chicken buses may not be all that interesting if you´re not in Central America, but I do need to tell you just a little more about this fascinating part of Central American culture. The economic model is worthy of being a Harvard Business Review case study. One of the intriguing parts of the Chicken Bus is how fast they drive, even through towns, how brief the stops are and how many people are packed into a single bus. When you understand the economic model, this all becomes understandable. (OK, so now you know I´m a little slow at Econ – you have probably figured out the reasons by now). These buses drive so fast that by USA standards, a speeding ticket for reckless driving would be in order. In many cities in Guatemala, walking on the side of the street is a norm because the of the condition of or due to the narrow sidewalks. If a Chicken Bus comes whizzing by, you better take care because they stop for nothing. The driver hires a helper who not only solicits riders but he also helps riders to hustle onto the bus and he helps to assure that you get onto the right bus. In Antigua, we often heard the doorman yelling ¨Guate, Guate, Guate, Guate¨ which means ¨Guatemala City, Guatemala …..¨. As soon as the last rider is on, the bus is already flying down the street with the doorman running to jump on. Or possibly he is still climbing up the ladder on the rear of the bus, loading goods onto the roof as the bus takes off. On one of our rides we were surprised that all of a sudden the doorman came in through the back door of the bus. He quickly collected the fares before the next stop when he had to be outside the bus hustling more customers. No matter how many people have been packed into a city bus in any large city in the US or maybe even Japan, that´s nothing compared to how people are packed into a Chicken Bus. There is absolutely no limit to the number of persons who are packed in. 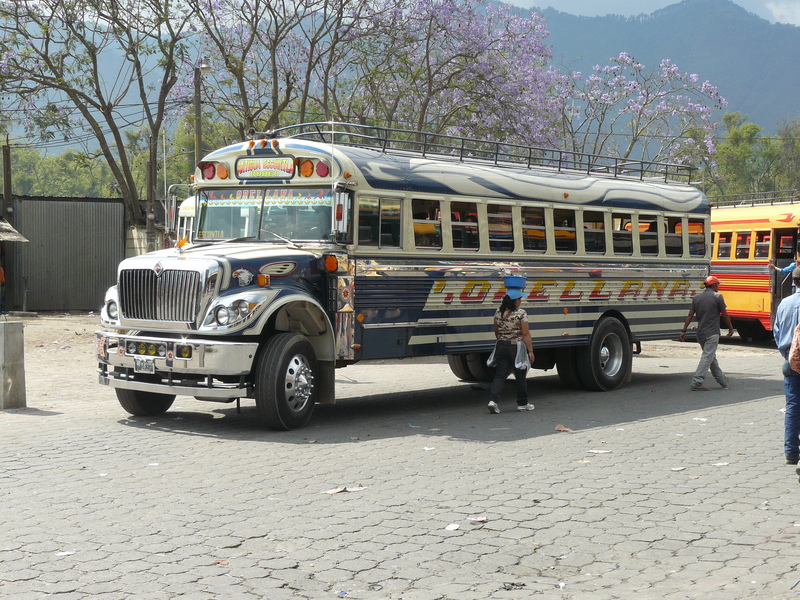 I think the saying is ¨this is Guatemala – there´s always room for 5 or 10 more¨. The bus we were on several days ago had an aisle that was honestly, no more than 8¨wide. While each seat really only is wide enough for 2-1/2 persons, there could be 4 or 5 in a seat. And butts from the right and the left seat touch in such a narrow aisle! You get the picture. I´m not sure if the economics of Chicken Buses is the key factor in all cases, but it´s a good guess. 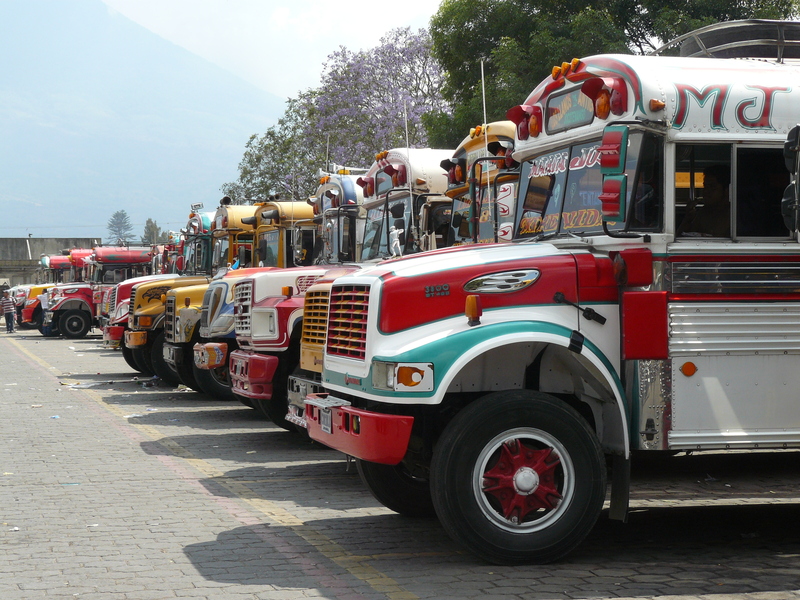 In the case of Guatemala City and Antigua, we learned that the driver of the bus must pay the bus owner $800 Quetzales per day (that´s a little more than $100) no matter how many passengers or even if the bus breaks down. The rest is his to keep. I´m thinking the driver has to pay for gas as well and of course he pays his helper. From the bus company, there is great pressure to make more runs and to stay on schedule while making sure that they get every possible passenger on board. Given the state of wages for an average worker in Guatemala, I´m thinking that the margin isn´t too great, so it´s possible that the driver could even lose money on a given day. Of note, my references to ¨he¨were not intended to be sexist – thus far we´ve not seen any women in any public transportation jobs; not any women taxi drivers, tuk-tuk drivers or bus drivers. 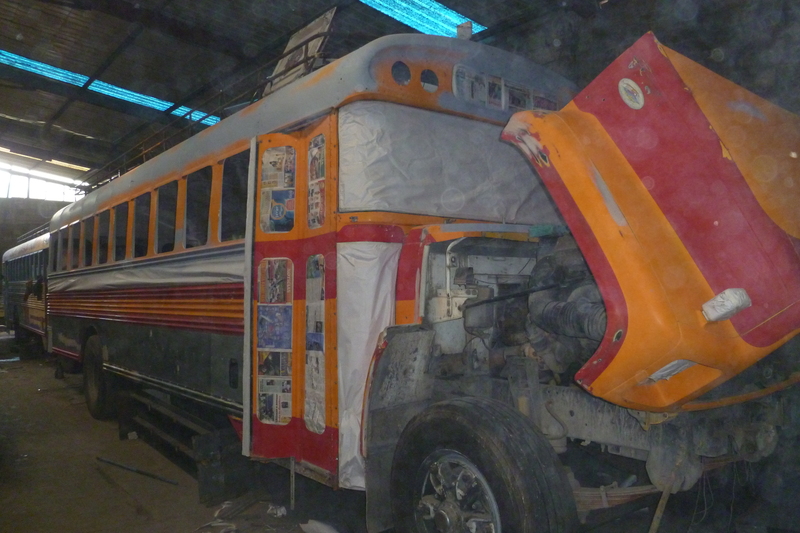 So that´s it for Chicken Buses.